The Germinatrix » Blog Archive » Garden Designers Roundtable – Color Your World With STUFF!!! 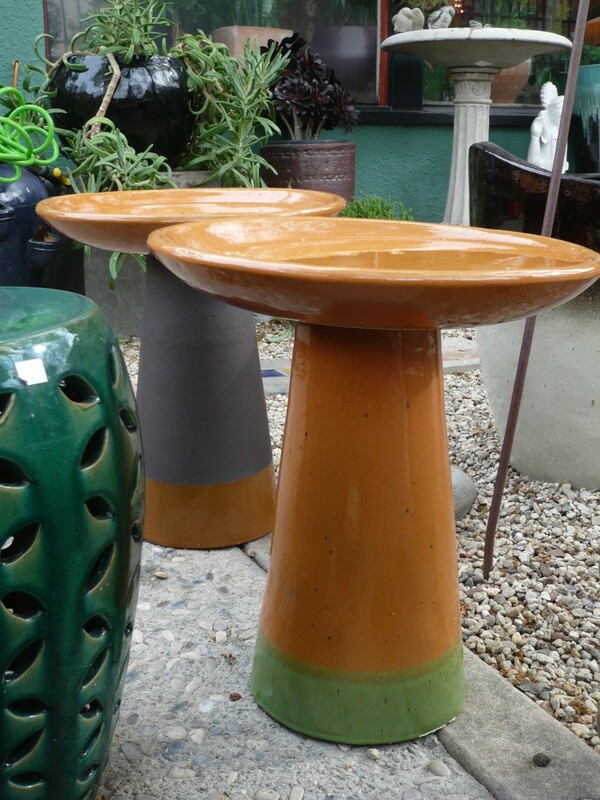 Garden Designers Roundtable – Color Your World With STUFF!!! I’ll bet you thought I was going to write about plants. I thought so, too! But when I started getting down to the business of writing about color in the garden, my brain kept wandering, and it was as if something was whispering in my ear … Potted … Potted … POTTED! I couldn’t ignore it. I ran to one of the greatest garden stores around, Potted in the Loz Feliz area of Los Angeles. Here, vibrant color is the rule, the law, the raison d’etre. J’ADORE!!! check out this super cool pot. what color would you call it? maybe ... persimmon? candy - colored tumbled glass! Tumbled glass is practically irresistible for the color lover. I’m a fan of using it in small doses – as a top dressing on containers, for instance. A little crazy-tinted glass goes a LONG way, so unless you’re doing a Las Vegas Showgirl Garden, you might not want rivers of the stuff - and I know this from experience. Rivers of tumbled glass easily tips the scale from exuberant to tacky*. Use it wisely and you’ll be happy. I rarely believe in restraint, except when I do. drippy drippy yummy yummy gimme gimme! Containers are where I go mad. 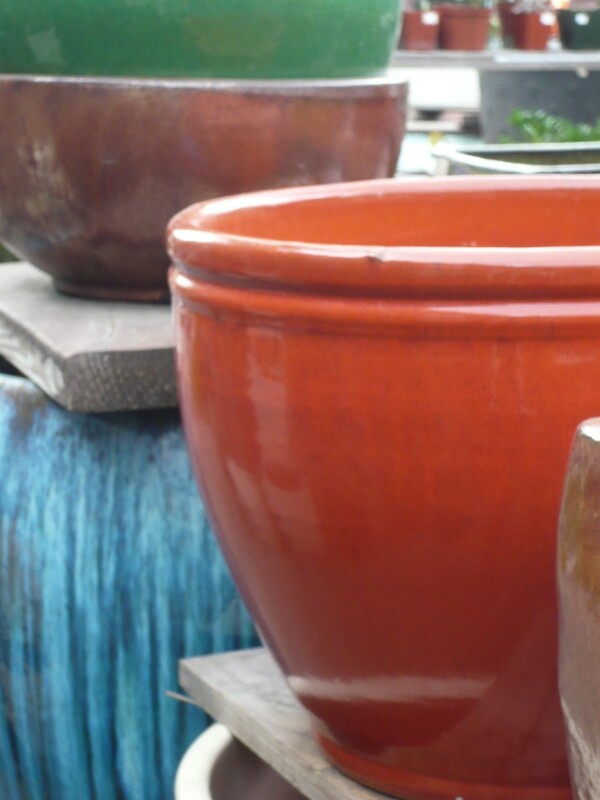 I cannot see using terracotta when there are so many amazing choices of glazed ceramic pottery. Is there a color theme in your planting? Echo it in the choice of your glazed pots! This kind of connective detail adds depth to your gardens. 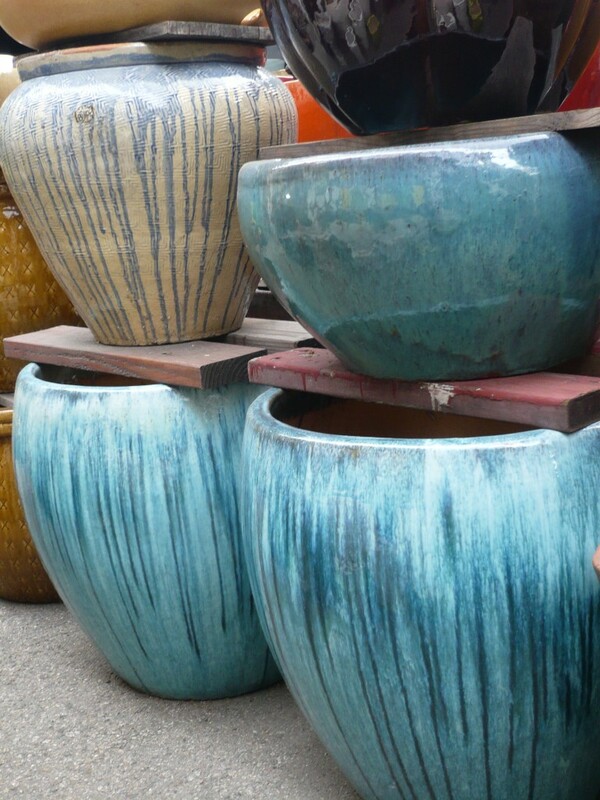 Since I love container planting, I have many, many glazed ceramic pots in my garden, in all different colors – I rationalize this because my garden is my “laboratory” and I need to try everything. 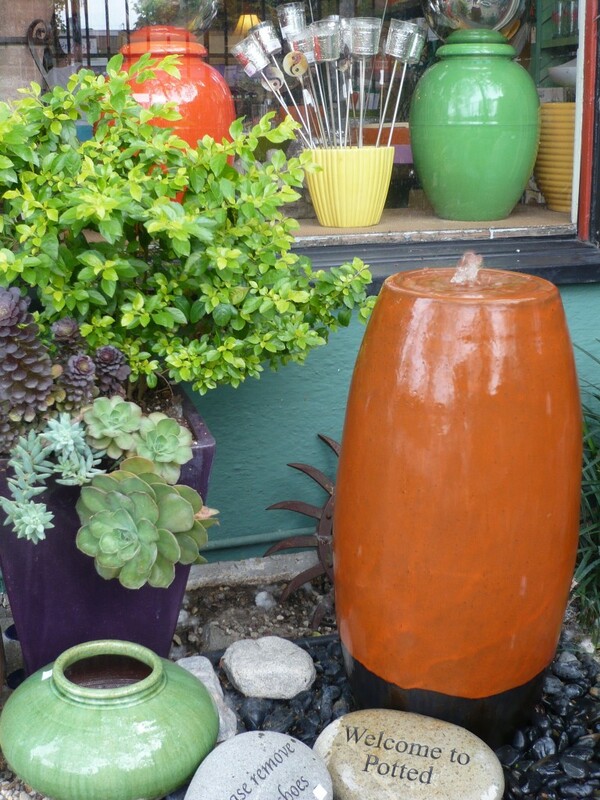 I CAN choose a reasonable palette of glazed ceramic pots for other gardens, but I tend to like either a strong monochrome, or a crazy rainbow, like a crayola box. An extremist, that’s me – to the core. For me, outdoor living is about having fun. The color that screams “FUN” louder than any is ORANGE!!! I Have an orange fixation. Admittedly, it’s not for everyone. Yes, some people want muted, relaxing colors in their gardens – but one thing every garden designer working in Southern California knows is that those colors wash out in the bright, hard, light we have. Saturated works for us! Chartreuse is as pastel as I get. I want this chair I want this chair I want this chair! As many of you know, this is the year of Turquoise – thus sayeth Pantone. So I encourage everyone to go a different direction – let’s give the underdog colors a chance! Saffron, Lichen, Cappuccino, Citron, Paprika, Eggplant … these are colors that need your support! what bird wouldn't feel extra special taking a sip from this lovely saffron birdbath? In closing, this plant maniac wants you all to know that there are so many avenues to injecting your garden with color. Go crazy!!! And a special thank you to Annette at POTTED for letting me snap away!!! Please stop over to Potted’s Facebook Fan Page and join the party! Now please take a little trip around the country and visit my fellow blog linkers! They are all being extra colorful today! Yay for this wonderful treatise on color, Ivette!! In my podunk town I haven’t found tumbled glass, but I’m suddenly in love – imagine just a dribble of it running through a pathway… OH! I am jealous of your wonderful stores. As far as underdog colors, give me eggplant and chartreuse! Those are my favorites. Thank you for these luscious photos and your wild sense of fun. What a joy to read! Ha! You’ve just given me my quote of the day…”Chartreuse is as pastel as I get” I love it! Great topic and great post. Being a fellow orange lover I say bring it on baby!!!!!!!!! you are wild about color and it shows! Beautiful examples and great information. Seems like your are THE PARTY ANIMAL of the group. LOVE your ideas and enthusiasm. What a great take on color to focus on the non-plant ways to incorporate it into a garden. Like Gen, colored glass had not reached our market yet but I love the idea of using it in containers as a mulch. Fun, fun, fun! 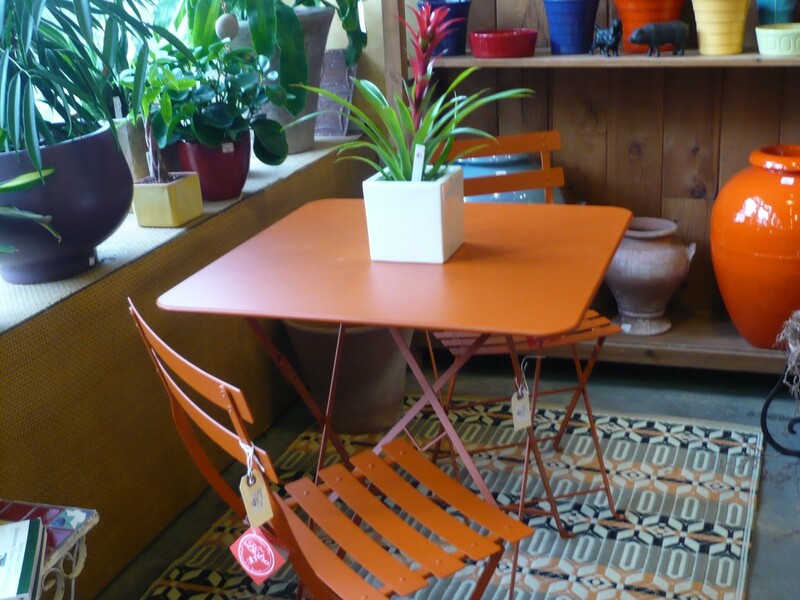 Why NOT go a bit color crazy with your garden accessories?! You don’t have to wear the stuff, so no worries… Thanks for the shopping therapy, Ivette! What great pictures, Yvette! It was so much fun seeing you on Sunday and I love all the other posts. See you soon! So glad someone else gives good shop! Now I want to go and buy, buy, buy. Good thing I’m on a budget. Well done, Germi. I work at a large garden center so I’m surrounded by all the beautiful things you showed. 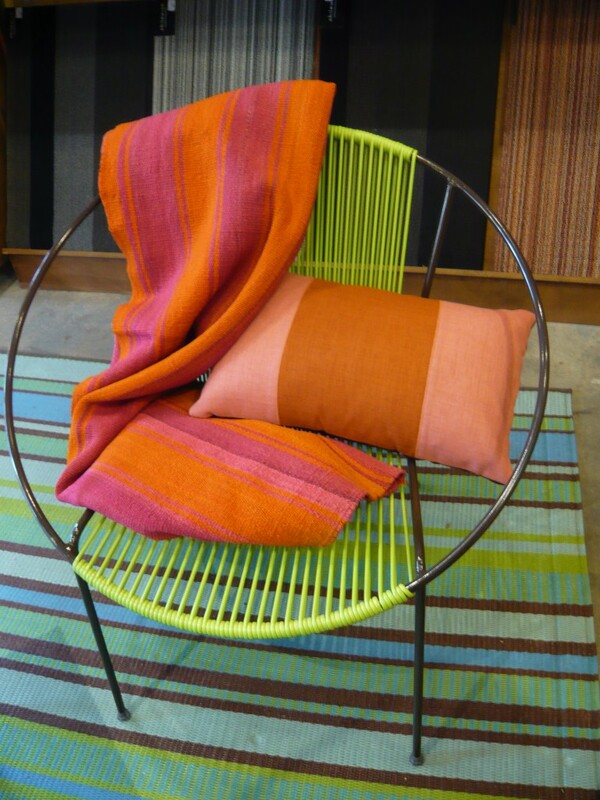 I love the earthy colors best – the saffron, greens and orange. And not a single plaid color (smirk ) amongst them. A beautiful confetti of colors and prose. 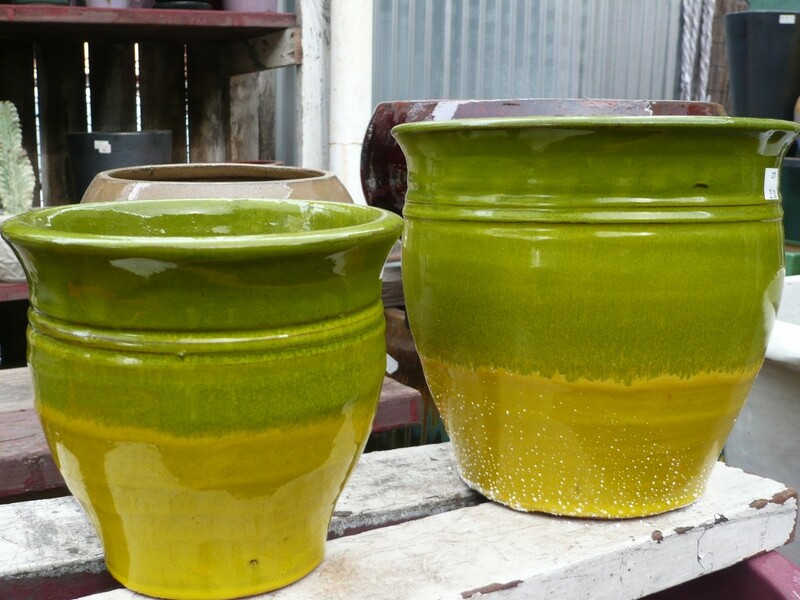 I’m crazy for colorful glazed pots too, Germi. You make me want to go shopping at Potted, that’s for sure. I love their display of colored glass. 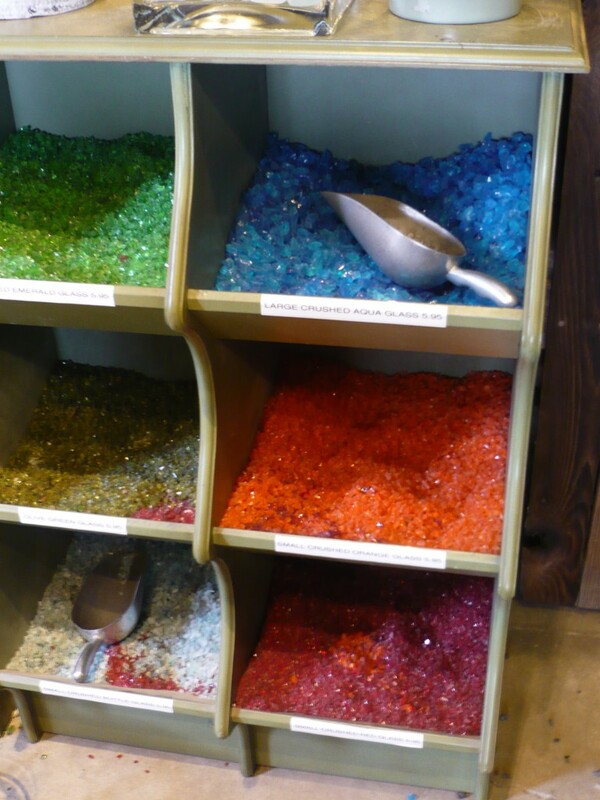 I’ve never come across that sort of thing in Austin, although Target and Garden Ridge sell colored glass beads that work great as a top-dressing on pots. I think you and I BOTH KNOW who’s going to be planning a Las Vegas Showgirl garden right after this reading. ;-D (Hint: Not me, another mutual friend of ours.) Love it. Right there with you on the tumbled glass front. I have seen a number of hell-strips around Austin that have used it extensively, it looks okay when newly implemented, but unfortunately over time there is usually grass growing through it. There is nothing worse than this, it just looks so bad and tacky. Tumbled glass walks a very fine line between looking cool and looking tacky at the best of times, but with litter and grass growing through it? It looks like a drunk has spent the night breaking bottles in your garden…it creates a sort of 1950′s depressing tenement / inner city aesthetic…(think trainspotting). Hope all is well G.
Happy happy Soler soler entertain me! Loree – I love that nothing rhymes with Orange! It is THAT unique! Shirley – And you are WILD, too! Carolyn – Glass in small quantities = garden jewelry! Michelle D – DAMN – I totally FORGOT plaid! Andrew – Kiss THAT Aster! The glass rivers will be FLOWING in Chicago! Sweet – I will be your personal Potted cruise director, I promise! ESP! – Miss the PATCH!!! Gotta visit right away … and I am so glad we are of one mind on the glass front. Of course. Goth friends think alike. What a fun post…. I love the comment about going a different direction than what’s in… though I do happen to love turquoise in the garden…. So great to meet you at SFGS germinatrix!